Networking Event: 5:30 – 7:00 p.m.
Price includes 1 game ticket for 200-level seat and admission to a pregame networking event at the brand new MasterPass Batter’s Eye Deck offering breathtaking views of the entire stadium. Pregame event features all-you-can-eat ballpark fare, Pepsi products, draft beer and wine. This event is family friendly. Rain or shine. There are 500 tickets available – each to be delivered electronically. 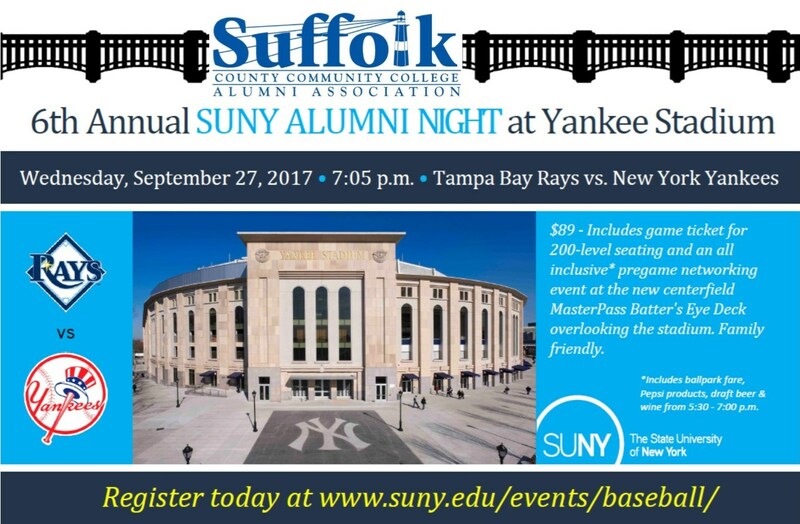 Posted on August 23, 2017, in Events and tagged #SCCCAlumni, #SUNYSFLK, Alumni, Alumni Association, Baseball, Networking, New York City, Reception, State University of New York, Suffolk County Community College, Yankees. Bookmark the permalink. Leave a comment.